Such a lovely photo It's good to have a cry sometimes. I just had a little cry, too. Found an old bottle of painkillers from the second time Sonic had a dental. I kept it as a superstition, as I kept the bottle of painkillers from his first dental for a few months, then the day after I threw it out, he started drooling and not eating! So I kept the second bottle as I was scared it would happen again. It's a month since I had to say goodbye to him, so it was all a bit much! She was both special and beautiful and it is sad she was taken too soon. But the time she had with you was enriched by your care and love for her - something she had been deprived of before you took her in. 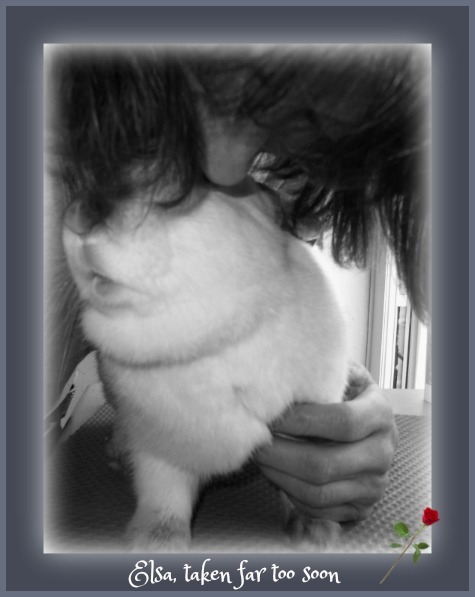 And all we can do is to give our rabbits that abundance of unconditional love.